Nyamirambo Women’s Center (NWC), a Rwandan NGO, community based tourism, was launched at the end of 2007 by 18 Rwandese women living in Nyamirambo, Kigali. Together they created a project which aimed to address gender-based violence, gender inequality and discrimination. Today, NWC’s mission is to provide education and vocational training to women who do not have the means to pay for such training on their own, so that they can gain better opportunities for employment. You can decide to take a day tour before your gorilla safari or after your gorilla safari or after you’re your conference meeting in Kigali, you can take a visit to this amazing place, you will really be carried away by the insight of the Rwandan culture here. ​To fulfill the mandate of these objectives, NWC offers free classes in literacy, English, basic computer skills, handicrafts and sewing, empowerment trainings on gender based violence and trainings on responsible community based tourism. ​At the end of 2013 NWC launched the product line “Umutima,” which means “heart” in Kinyarwanda. With this project, NWC trains and employs women from the community to create a large variety of women’s accessories, children’s clothing, and home decor products. At the moment there are over 50 women employed by Umutima as seamstresses. Umutima and NWC have grown into a unique, self-sustaining model where the profits earned through Umutima are used to fund NWC initiatives, in addition to providing benefits and a fair wage to the seamstresses. ​NWC is also sustained by income generated by the increasingly popular tourism offerings in Nyamirambo. Adhering to the principles of Responsible Community Based Tourism (CBT), these tours give tourists a uniquely personal insight into everyday life and local social culture. Also as a part of their CBT initiative, the Center offers basket weaving and traditional cooking workshops. ​Finally, at the beginning of 2014 a small community library across the street from NWC was inaugurated, offering books in Kinyarwanda, English and French. The idea behind the library is to encourage reading among the youth in Rwanda and to promote the idea of “one child, one book” in a country where many children do not have the opportunity to read and discover the world through books. The walking tour begins with a traditional snack, a quick Kinyarwanda language lesson, and an introduction to the Women’s Center and its activities. It then weaves through the streets of Nyamirambo, where your guide will introduce you many friendly locals. You’ll visit a women’s hairdressing salon where the adventurous type can get a free braid; go into a family compound to pound cassava leaves; stroll by two mosques and a lookout view over Kigali; and into a tailor shop to feel the fabrics you’ll otherwise see styled on the streets. The tour concludes with a traditional lunch made and served in the home of Aminatha, NWC’s best cook. This walk can go as far as half day, for you to explore this area. From market to meal, every step of the process of cooking is shared by Aminatha and participants in this tour. After buying produce and ingredients at several markets the group walks just around the corner from the Center to Aminatha’s home. There they get to work at a wooden table in her courtyard, chopping countless vegetables and starting the charcoal stoves. Under the guidance of Aminatha six traditional, delicious, and gratifying dishes are prepared and then shared by all involved. Why Community Based Tourism (CBT)? By doing a Kigali cultural tour, Nyamirambo Women’s Center should not miss out on your safari planning to visit Kigali. You can include this as part of your gorilla safari to Volcanoes National Park or wildlife safari to Akagera National Park, or park of your leisure visit on having a successful business meeting conference in Kigali. You can get in touch with our reservation team at info@rwandaecocompany.com for a safari visit to Nyamirambo Women’s Center. The Kandt House Museum previously known as the Kandt House Museum of Natural History, is one of the eight museums that make up the Institute of National Museums of Rwanda, formerly known as the Kandt Residence, it was once the home of German physician and explorer Dr. Richard Kandt. It was Dr. Kandt who founded Kigali around 1908 to be a center of administration for German East Africa. The Institute of National Museums of Rwanda converted the historic residence into a museum in 2008 in order to increase Rwandans’ exposure to the natural sciences as well as to educate visitors from around the world about Rwanda’s biological and geological diversity. The first part presents Rwandan life in all its aspects – social, economic, and political – before the colonial period. The second part traces the experience of the Rwandan people during the colonial period. Following the Berlin Conference in 1884, the Germans ruled Rwanda until 1916, when the Belgians took over under the League of Nations Mandate after World War I. Richard Kandt’s life and deeds in Rwanda are covered here. Entrance to the museum isn’t cheap for expats: Non-residents have to pay 6,000 francs which is roughly $8 for entry and those with resident visas or pass ports, and any form of identification pays relatively a lesser fee of 5,000 francs which is roughly $6. Exploring the museum does not need you much time as in an hour or two to walk through, depending on how much you choose (or are able) to stop and read can make you get through your visit. Unfortunately for us English-only speakers many of the exhibits are in German or French. This detracts from the experience a bit as you may miss out on some of the in-depth information, but for the most part the exhibits are simple enough to understand by sight alone. The museum is kept open for visitors from Monday through Friday from 9am to 5pm, and you don’t have to worry about any large crowds who also come with the same intention to tour and get first hand information about the museum, just join the group and get yourself going. Kandt House Museum, the former Natural History Museum is located at KN 90 St, around one kilimiter from downtown. The Kigali Convention Centre is a convention centre in Kigali, the capital and largest city in Rwanda, opened in 2009, located on Highway KN5, adjacent to the KG2 Roundabout, about 6 kilometres (4 mi) west of Kigali International Airport. This is about 7 kilometres (4 mi) east of the neighborhood of Kigali called Nyabugogo. The Kigali convention center has become a premium venue for meetings, incentives, conferences and events attract thousands of travelers coming to Rwanda for conference tourism. It is widely known as a first stop center for conferences hence the best MICE destination in Africa and the whole globe. “With a net floor area of 32,200 square metres, the Convention Centre, can host more than 5,000 delegates at a time and contains facilities for business, leisure and events. The multifaceted design reflects a true Rwandan homestead,” reads a statement from Radisson Blu. Spanning over 80,000 sqm, the Radisson Blu Hotel & Convention Centre, Kigali features exclusive hospitality facilities with functional technology and clear reference to the culture and traditions of Africa. Not only boosting MICE activities within the regions, the conference center had greatly boosted the country’s Rwanda’s economic potential through a strong boost on Rwanda’s tourism as many visitors who come for the conference end up with doing of to the tourism activities like gorilla tours, golden monkey trekking, volcano climbing and game viewing safaris in the national parks in the republic of Rwanda, since its opening in 2016. This has boosted on many travel agencies to open up in the country to meet the market demand. The complex’s egg-shaped dome and ribbon-striped hotel are a familiar sight to Kigali residents and a point of pride for the city. Still, many don’t know what inspired the convention center’s unique shape and bright colors. Is one of the most attractive tourism sites in Kigali, looking so beautiful at night with wonderful colors of light. Roland Dieterle, the complex’s principal architect, came up with the concept some 10 years ago. The resulting vision merges Rwanda’s traditional past with its focus on the future. Dieterle says the scope and complexity of the project carries an important message: “It says, ‘We are a modern country, we can deal with complexity, we can show the world that Africa is a continent and Rwanda is a country where modern life can take place,’” he says. 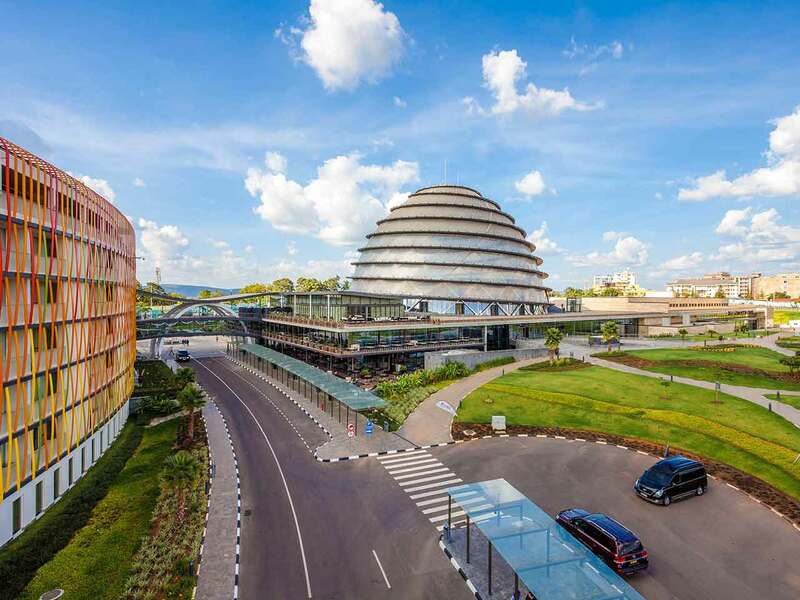 Here are six of our favorite little-known facts about the Kigali Convention Center Complex, published Lauren Everitt, Editor-in-Chief of MindSky. The builders used 3-D design methods and a computerized manufacturing system to build the convention center dome. The dome’s frame is so complex that each steel piece had to be designed and manufactured separately — there are only two of each piece in the entire building. “Never before has a building of a similar size and complexity been built in the region,” Dieterle points out. A king’s palace and traditional Rwandan homes inspired the shape. Dieterle traveled around the country and visited the King’s Palace in Nyanza during the planning phases. He was so inspired by the king’s bee hive-shaped residence that he used it as the basis for the convention center dome. The spiral motif found in Rwandan baskets and other art, such as imigongo paintings, was also incorporated in the building’s structure. Viewers can see the spiral construction in the walkways that encircle the dome and by looking up at the dome’s ceiling from the inside. The Kigali Convention Center’s spiral dome was inspired by traditional Rwandan architecture and art. Sustainability was a major consideration for the project designers. “We wanted whatever we did to be a role model for sustainable development,” Dieterle says. The dome uses window shades and a special coating to help regulate the inside temperature and to conserve energy use. The complex was also designed to use “gray water” (wastewater from homes or office buildings) for irrigation and toilet flushing. Even the dome’s bright lights are energy-efficient LEDs. The hotel’s colorful ribbons represent Rwanda’s rich weaving tradition. The brightly colored metal ribbons that run down the length of the complex’s Radisson Blu Hotel were inspired by the strips used to make Rwandan baskets, according to Dieterle. Rather than using the browns, grays, and whites of most new construction projects, Dieterle and his team opted for the vibrant colors of local fabrics. The result is a “fresh and friendly” look that sets the building apart from others in the region, he says. While the convention center hasn’t officially opened, it’s already garnering praise for its novel design. In 2009, the International Property Awards recognized the center with its Architecture Award for Africa. In 2013, the complex received one of the internationally recognized Iconic Awards in the Concept category, and in 2014, it was a nominee for the German Design Awards. It’s transparent for a reason. Dieterle says the convention center’s dome is purposefully transparent to show openness. The idea is that all Rwandans should be able to enjoy the building, whether watching the exterior lights or observing the hustle and bustle of big events inside. The design is also meant to speak to everyone. “It’s a building that doesn’t need much explanation … even people without much knowledge about art or culture would understand this design. It’s a building for them, not just for some elite people,” Dieterle says. A museum on the bottom floor of the IT office park. The memorial is the final resting place for more than 250,000 victims of the Genocide against the Tutsi. The memorial ground was open up for tourism and other visitors to visit the museum after its completion in 2004, a process that began in 1999 when the City of Kigali provided land where a place of remembrance could be built and where victims of the Genocide against the Tutsi could receive a dignified burial. Construction of the Kigali Genocide Memorial began in the same year and the process of burying victims began in 2001. This was supported the following organization that played a major role in the set up of the museum. Today, what was a mass burial ground of the victim of the genocide incident, has turned up to be one of the great museum in the world, known as the world’s largest collection of archival material and testimonies, the museum has become a big part of Rwanda’s major tourism attraction, attracting number of tourist to the country who does come to visit and get to know the history of the genocide and how Rwanda has coped up with it. Indeed its part of major gorilla safaris and other wildlife safaris whereby the city tour to visit the Kigali Genocide memorial is always included before the safari as one head for his safari or after safari before one is dropped at the airport. The Genocide Archive of Rwanda is the world’s largest collection of archival material and testimonies related to the Genocide against the Tutsi, this has greatly attracted many tourist to visit the museum. Number of school going students also do visit the memorial ground to have first hand information about the genocide which happened years back and also witness its impact. Its central location and nearness to the city center and airport has made its access quite easy. Also the donation by the tourist upon their visit has greatly supported the well maintenance of the museum as the funds generated are used in the today daily management of the museum activities and staffing. The Kigali Genocide Memorial includes three permanent exhibitions, the largest of which documents the 1994 Genocide against the Tutsi. There is also a children’s memorial and an exhibition on the history of genocidal violence around the world. The education centre, gardens, and Genocide Archive of Rwanda contribute to a meaningful tribute to those who perished, and provide a powerful educational experience for visitors. The Genocide Archive of Rwanda is a collaborative project of the Kigali Genocide Memorial, Aegis Trust, and Rwanda’s National Commission for the Fight against Genocide. The objective of the archive is to document the 1994 Genocide against the Tutsi. The archive has a physical repository as well as website accessible around the world. The interactive online digital archive contains materials that document the causes, lived experiences, and aftermath of the 1994 Genocide against the Tutsi. The site features video testimonies from genocide survivors and rescuers, perpetrator testimonies from the Gacaca court proceedings, footage from annual remembrance ceremonies (Kwibuka), archival photographs, colonial documents, identification records, maps, foreign serials and propaganda publications. This is the only project of its kind in Rwanda and allows previously inaccessible material to be consulted for personal, educational, and research purposes. The physical materials that make up the archives have been contributed by survivors and partner organisations. The physical collection of the Genocide Archive Rwanda is accessible at the Kigali Genocide Memorial. To inform and educate visitors about the causes, implementation and consequences of the genocide, and other genocides throughout history. To teach visitors about what we can do to prevent future genocides. To provide a documentation centre to record evidence of the genocide, testimonies of genocide survivors and details of genocide victims. To inform and educate visitors about the causes, implementation and consequences of the genocide, and other genocides in history. The Genocide Archive of Rwanda’s collection contains over 8,000 photographs, videos and documents related to the 1994 genocide against the Tutsi. Materials about pre-genocide history and post-genocide reconciliation and recovery initiatives in Rwanda are also included. Browse through and search to find specific content that may be of interest to you. Every year, thousands of Rwandan and international students visit the Kigali Genocide Memorial. The students are guided through the memorial to learn about the causes, reality and consequences of the Genocide against the Tutsi in Rwanda. They are also taught about the importance of remembering genocide so that it can never happen again. The education programmes run at the memorial share an important message of remembrance, peace, and personal responsibility. Visiting students learn about the unique efforts Rwanda has undertaken to overcome the challenges since 1994 and to foster a sense of shared national identity. Rwandan History: A group discussion on the economic, political and social factors that lead to conflict and violence. Understanding the ‘Continuum of Violence:’ A set of interactive discussions on analysing violence and decision making to comprehend how it happens. The Consequences of Genocide: A question and answer session on the challenges faced by individuals and society after genocide and how to overcome them. The Road to Peace: An interactive session that asks the question, ‘How is it possible to have sustainable peace after genocide?’ and tells the stories of peacemakers helping to rebuild their communities. All education sessions at the Kigali Genocide Memorial are participatory to ensure students get the most out of their experience and take the lessons home with them. The memorial’s education programme is currently undergoing an expansion thanks to the construction of four new classrooms that were opened in April 2014 at the 10th anniversary of the memorial. Each year, the memorial receives thousands of students. ‘Café du Memorial’ and the souvenir shop at the Kigali Genocide Memorial are small-scale social enterprises. They were been developed by young Rwandans wanting to change their livelihoods, support others and give meaning to their work. The income generated from these social enterprises is invested back into the memorial to support the preservation of archives and to run education programmes the memorial. The Kigali Genocide Memorial is a guided experience. Visitors can choose to be guided by one of the staff witnesses or tour around alone on self guide or purchase the KGM digital guide which provides an audio-visual tour of the memorial. Children below age of 12 years are not allowed to access the museum as this is looked at as may not be good for their health. People above 12 years are allowed to access the museum. The museum is open for the visitors from 8:00 am to 5:00 pm (last entrance is at 4:00pm) 7 days a week except the last Saturday of each month. On the last Saturday of each month, the memorial is open from 1:00pm to 5:00pm due to Umuganda community work (last entrance is at 4:00pm). The Umuganda community work, is a kinyarwanda term, this is when the community is involved in the cleaning up of their environment. The Kigali Genocide Memorial is located in Gisozi, ten minutes drive from the centre of town. The easiest way to reach the memorial is by car or through making arrangement with our company reservation team, who will include this as part of the city tour. Just email us at info@rwandaecocompany.com. For any safari tour, or visit to Kigali Memorial ground as part of your Kigali city tour or gorilla safari in Rwanda feel free to contact our reservation team, they will sarrange something perfct for your interest.